The Academic Integrity Office is your resource for preventing and responding to academic integrity violations in your class (see http://academicintegrity.ucsd.edu/ for detailed information and resources for instructors and students). They are experts on how you can design into your classes some best integrity practices that will make cheating the exception and integrity the norm. They can teach you strategies for communicating integrity to your students, reducing cheating temptations and opportunities, integrating integrity lessons into your curriculum, and responding to cheating when it occurs in order to leverage the teachable moment. If you’d like a 1:1 consult or training for you and your Instructional Assistants, just send your request via an email to aio@ucsd.edu. We know from the research that having students sign an integrity pledge right before they are given the opportunity to cheat can reduce or eliminate cheating. If you’d like to try this, we recommend using this pledge at the beginning of the quarter, and then having students reaffirm that pledge (“I pledge that I completed this assignment/exam with integrity as promised”) on every exam and assignment. If despite your efforts, a student still violates academic integrity (between 10-43% of students admit to cheating at least once/year, so it’s bound to happen), you will want to respond in order to leverage the teachable moment. This means stopping the behavior in progress (if possible), collecting all of the applicable documentation, and reporting to the AI Office. The AI Office uses the cheating experience as a starting point in Kolb’s Experiential Learning Cycle to leverage that moment for learning. Students are always assigned AI Training, and a few students are suspended for their violations (and even fewer are dismissed). Students facing suspension or dismissal either have a violation history or their violation was so egregious that the University believes suspension is necessary to create the teachable moment. You can see our Administrative Sanctioning Guidelines online, where you can also receive faculty-to-faculty advice for issuing academic sanctions in response to integrity violations. If you have general questions, feel free to contact the Academic Integrity Office (aio@ucsd.edu or 858-822-2163) for assistance or consultation. Check out the resources available to instructors and TAs through the UCSD Center for Teaching Development (http://ctd.ucsd.edu/). They offer helpful workshops throughout the quarter, and you can arrange for a consultation or assessment to get feedback on your teaching. Listed below are instructions on how to access the Class List page from Blink. Then it will take you to a page to login with your UCSD Single Sign-On, you should get to the page to find your class. You then have the option of entering your corresponding Section ID or searching for your course to access your class list. Academic Computing & Media Services is dedicated to meeting the needs of faculty through educational technology and support. Instructors can evaluate class comprehension or retention of complex material and create an interactive learning experience by polling students using a student response clicker system. This instant feedback enables instructors to tailor lectures to their students’ needs by indicating whether to move forward or review material. Information about i>clickers and how they work can be found at http://acms.ucsd.edu/faculty/clickers/index.html. Another resource available is CINFO provided by Educational Technology Services. CINFO requests (https://cinfo.ucsd.edu/default.aspx) are submitted by instructors who need non-standard computing resources or facilities for their courses. Such resources include discipline specific and productivity software, web and cloud resources like JupyterHub, WeBWorK, and Google Groups, additional disk space, designated computer lab resources, access to computer labs managed by ITS including door codes, and specialized software (such as ArcGIS, Adobe Suite, language software). There is also a section in the CINFO form where instructors can request resources not currently available. Podcasting and video streaming options are also available. More information about podcasting can be found here: http://podcast.ucsd.edu/info/. Additional resources for faculty through Educational Technology Services include Turnitin (originality checking software), Technology Enhanced Classrooms (includes projectors and document cameras), Computer labs and software (access to ACMS labs with licenses for lots of popular software), and Virtual Computing Labs (access to specialty software from a personal computer, tablet, or smartphone). Educational Technology Training Calendar - Want to learn more about using educational technology tools in your course? Click on any class in the calendar to sign up (registration is required due to limited space). You will receive an email confirmation once you are signed up and an email reminder a day before the class. If you don't see a class that works with your schedule, just click here to send us a request for 1-1 training. See detailed course descriptions. Gradescope (https://www.gradescope.com/) streamlines the tedious parts of grading paper-based, digital, and code assignments while providing insights into how your students are doing. It supports variable-length assignments (problem sets & projects) as well as fixed-template assignments (worksheets, quizzes, or exams). In addition it stores all assignments and exams which will be helpful when the department is submitting information for CEPH accreditation. It is strongly recommended that you submit your request at the beginning of the quarter to ensure the spaces are still available. Please note, a Special Events Parking Space Request Form must be submitted at least 3 business days before events needing 5 spaces or less or at least 2 calendar weeks before events needing more than 5 spaces. For courses on main campus, the Media Services team regularly checks all classroom media equipment to ensure it is working properly and will provide technical assistance to you during your class if you call 858-534-5784 from the phone near the Media Station. Technical assistance is available from 7:30am - 7:30pm Monday through Thursday and 7:30am - 5:30pm on Fridays. If you need assistance using the installed equipment or Media Station controls, or if you are podcasting for the first time and need information about microphone placement, someone from the Media Services team can meet with you for some hands-on assistance. Just send an email request to servicedesk@ad.ucsd.edu. For courses in the School of Medicine, the Health Sciences AudioVisual Services Unit provides prompt, reliable, courteous, and technically-competent service to instructors. If you need assistance in your classroom please contact them at 858-822-5220. AV Services operates from 7:30am - 4:30pm Monday - Friday. You can also email them at AV-Rooms@ucsd.edu. For Exam printing instructors have the option to go through Campus Imprints using PrintConnection. If you don’t yet have an account you will want to create a new account online. Once you have an account, log into PrintConnection, then select the type of print job you need and click “Begin.” They do require a minimum of 1 week notice to ensure the exams will be ready in time. If you wish to have free delivery instead of you or the TA/Reader/UGIA picking up the exams, you will want to include that in the Special Instructions section of the form. You can also call (858) 534-3020 to confirm the free delivery of your order. Instructors and TAs also have the option of using one of the two photocopier/scanner machines in the department. Please see the Scanner/Photocopier for Public Health Education Programs tab for more information. The Public Health Education Programs are obligated to provide accommodations to every student who provides his or her Authorization for Accommodation (AFA) letter. Students must present copies of their AFA letters both to their instructors and to the Public Health Student Affairs Office. If you have any questions or concerns, please contact the OSD department liason Dina Rodgers (drodgers@ucsd.edu). Please contact the corresponding Student Affairs Staff if you need to reserve a room for a student exam as soon as possible so there is no delay in arranging for accommodations. If a conflict with the student’s religious beliefs does exist, the instructor will attempt to provide an alternative, equitable examination that does not create undue hardship for the instructor or for the other students in the class. If you wish to reserve a room outside of your scheduled class time (for instance, for a review session), please send your request at least one week in advance and include the class number, size, and requested date(s) and time(s). Please note that review session rooms are typically only available in the evenings. Please contact the corresponding Student Affairs Staff for any requests. Two FMPH Department Scanner/Photocopier Machines are available for course Instructors and TAs to use. The first machine is located in the MTF Building on the second floor (map). The second machine is located in the Student Affairs Advising Office in University Center 202, suite 400 (map). A green card and course index is required for use and all files must be in Pdf format (word documents will not be recognized). The BSPH green card is attached to both machines. For MPH courses please contact Josh Miller and Rosemarie Subala (mphinfo@ucsd.edu). Please note, the Scanner/Photocopier Machine located in the Student Affairs Advising Office can only be used with a USB and doesn’t have email capabilities. Instructors and TAs should email MTF Admin (mtfadmin@ucsd.edu) to schedule time to use the machine located in the MTF Office to ensure availability at the desired time to use the machine. Instructors and TAs should email Dina Rodgers (drodgers@ucsd.edu) to schedule time to use the machine located in the Student Affairs Advising Office to ensure availability and that the office is open at the desired time to use the machine. A Teaching Assistant (TA) assists in the instruction of a course at the under the supervision of a faculty member. The TA primarily assists the faculty member in charge of the course by conducting discussion or laboratory sections that supplement faculty lectures and by grading assignment and examinations. A TA may also assist with the development of assignments or exams, hold office hours, and proctor exams, and scribing. In the case of basic language, reading and composition, some other skills building courses, and a few other courses, a TA may lead the class meetings, but as with all other TAs, the general instructional content of the course as well as the official assignment of student grades and decisions on grade appeals are the responsibility of the faculty member in charge of the course. A Reader assists a course instructor by grading homework, papers, or exams and may also hold office hours to answer students’ questions about such assignments. Readers may be expected to attend all lecture classes at the discretion of the instructor and should expect to assist with proctoring examinations and scribing. One of the important duties assigned is proctoring exams. The instructor and TA/Reader need to meet to discuss what the process and expectations will be for proctoring the exam. For example, how to actively monitor the exam by walking around the room. Undergraduate Instructional Apprentice (UGIA) duties will be inclusive of a combination of the following responsibilities, depending on instructor's instructional needs. Assist with proctoring examinations, scribing, and grading. Assigned Hours for TAs: Please keep in mind that a 50% TA can work a maximum of 220 hours for the quarter, cannot work over 40 hours in any one week and cannot work more than 8 hours in any one day. This applies proportionally for TAs at other appointment percentages (e.g., 25%). Please see Teaching Assistant (TA) Support for additional information and resources. Assigned Hours for Readers: Please keep in mind that a Reader is 25% and can work a maximum of 110 hours for the quarter, cannot work over 10 hours in any one week and cannot work more than 8 hours in any one day. Assigned Hours for UGIAs: Please keep in mind that a UGIA is 25% and can work a maximum of 110 hours for the quarter, cannot work over 10 hours in any one week and cannot work more than 8 hours in any one day. Please see Undergraduate Instructional Apprentice (UGIA) Support for additional information and resources. The Student Affiars Staff can request desk copies for required textbooks for the number of graduate TAs assigned to the course if asked by the instructor of record in advance. Please contact the corresponding Student Affairs Staff if if you have any questions regarding textbooks. The Public Health Education Programs offer the Time with Profs Program for FMPH teaching faculty to provide a meal out with their TAs, Readers, and/or UGIAs one time per quarter. The deadline to take part in this program is the Tuesday after Final Exams. Vouchers are available in the Student Affairs Office and are only valid if presented by the instructor. For outside locations, a max of $16.50 per person can be reimbursed. Instructors are also more than welcome to take out the teaching team to any location and get reimbursed by submitting the receipt to Dina Rodgers (drodgers@ucsd.edu) for BSPH courses and Josh Miller (j3miller@ucsd.edu) for MPH courses. A max of $16.50 per person can be reimbursed. PLEASE NOTE: The Time with Profs Program is available for one meal or coffee per student with the instructor. No alcohol can be reimbursed. If alcohol was purchased, please ask for a separate receipt that does not include the alcohol for reimbursement. 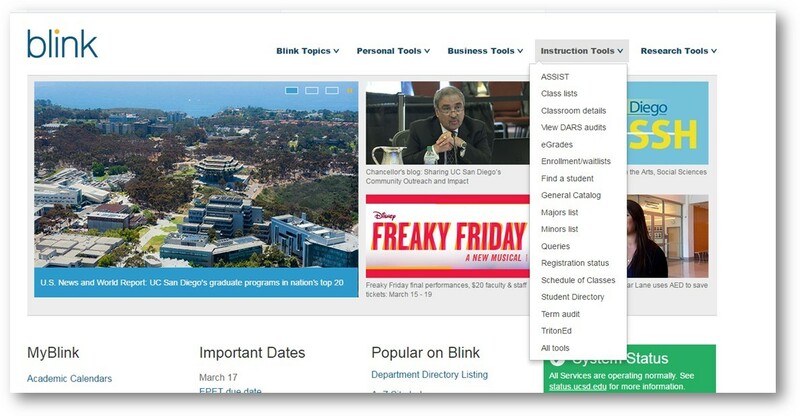 TritonEd, formerly known as "Ted", (https://tritoned.ucsd.edu) is a course management system you can use for your course. You can upload your syllabus, post course content, create a discussion board, and post or email students course reminders and announcements. TritonEd also provides a secure way to post exam grades that only enrolled students can access. If this is your first time using TritonEd please go to https://blink.ucsd.edu/faculty/instruction/tritoned/index.html for additional assistance. On TritonEd, you will also be able to indicate the names and official UCSD emails of your TAs/Readers as well as what level of access the TAs/Readers should have to the class. This should be done as soon as possible so the TAs/Readers can begin assisting with the class. 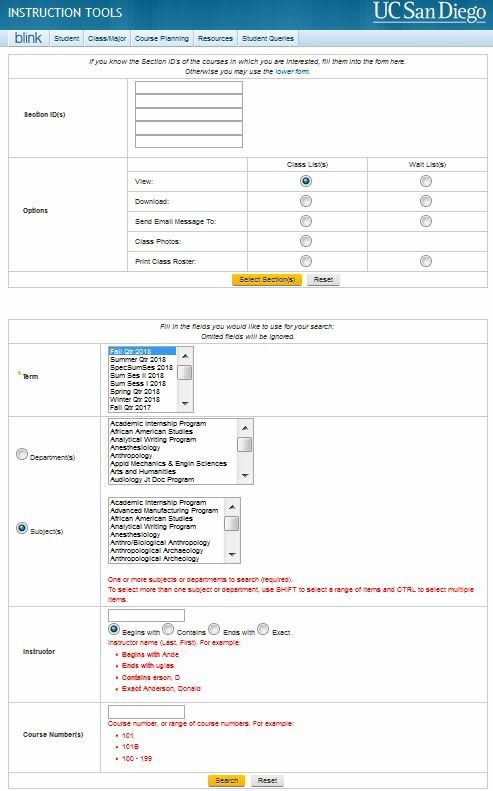 Upon request to edtech@ucsd.edu, instructors can link their TritonEd course rosters with Gradescope and sync grades from Gradescope with a column in their Grade Centers. Please send this request from your UCSD email address and include the course title.